A fairly common complaint is that of water leaks from the rooftop air conditioner. These do not have to be nearly as hard to find or fix as people often make them- they simply need to be dealt with in a systematic method. The first question when dealing with this type of leak is- does it leak when it's raining or when the air conditioner is running (or, more rarely, both)? To deal with either, we need to look closely at how the air conditioner is mounted, and how it deals with the condensation generated while running. The main thing to keep in mind, is that the air conditioner is sealed to the roof using a sponge rubber gasket- this gasket is compressable, and really is a long term maintenance item (they can last years, but not forever). This gasket is compressed by 3 or 4 bolts running from the inside assembly up to the top. For either "rain only" or "while A/C is running" leaks, first make certain there is at least 1/2 inch of gasket left (it is not tightened right down to the roof), then check the bolt for tightness- just make sure they are all snug, but don't over tighten- there must be the gap between the bottom of the A/C and the roof. The reason for this gap is that on most roof top A/C/ units, the condensation drains out the bottom of the unit- between the base of the air conditioner and the roof. For this reason, never, ever seal around the perimeter of the air conditioner- I cannot say how many times I have had to deal with a unit where someone slopped goop around the base of the air conditioner, trapping water in where it has to leak inside. 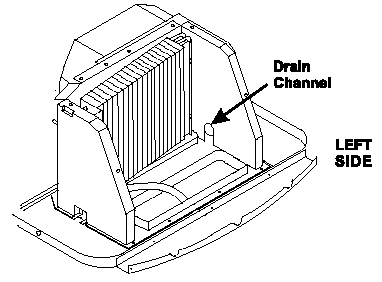 The "inside"coils of the air conditioner sit in a drain pan, to collect the condensation, which then runs out a small hole in the side, and out the bottom. If the leak is both while raining, and while running, and the gasket is still thick enough and tight, odds are there is some roof deterioration underneath the air conditioner- as long as the roof isn't sagging, causing water to puddle up around the air conditioner, which can be checked by pulling a string across the roof, from side to side. If there is significant sag, the air conditioner needs to be raised, either by installing 2 gaskets or by removing the air conditioner and putting shimmed between the roof material and roof frame- this is the method I usually use, building up with strips of 1/4" plywood, until the air conditioner is high enough that water cannot run in. Of course, roof sag may be an indication of a larger problem, but quite often it is just age, and other than a bit of sag, there are really no structural problems. If the leak is only while the unit is operating, first check all of the above, if everything checks out, odds are that the drain holes are simply plugged up, or that the evaporator coil is very dirty, which will cause enough suction to keep the water from draining properly. To deal with this, we have to get up on the roof, and do some disassembly. 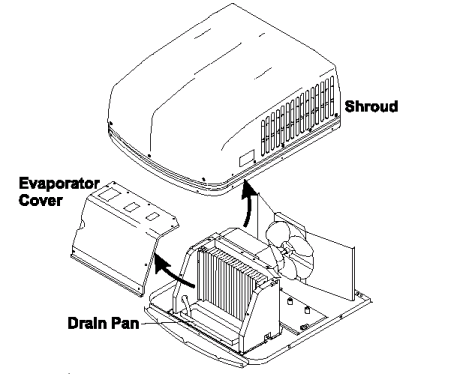 You have to remove the plastic shroud, and then the front evaporator cover, which is usually held on by a number of screws. This will get you in to the evaporator and drain pan- it is usually fairly obvious if the drains are clogged, and they are easily cleaned, but if you are going this far, it is a good time to check the evaporator coils for dirt, and clean them if needed (if they haven't been cleaned in a while, it really wouldn't hurt to clean them. Coleman recommends "Formula 409" cleaner, which works well- I use "VoomRV", but most mild degreaser type cleaners should do fine. I don't like to use the standard coil cleaner products for this, as most of them are acidic, and while they would be fine in a large house air conditioner, I don't like the idea of these products running down the outside of an RV. Another great cleaner that I don't like for this application is "Simple Green"- it has some issues with aluminum. The hardest part of cleaning the coils is rinsing them off without flooding the inside of the RV- being very careful with the water, putting rags in the opening from the top, and putting down a protective cover inside should keep everything A-OK. While you are up there with all these items, cleaning the outside condenser coils is a great idea- on air conditioners only a few years old, I can usually lower the amperage draw by 1 to 2 amps, simply by cleaning these coils (letting them get rid of the heat more easily). So- understanding what kind of leak you have, and where the water is supposed to go in a properly operating system, we can see that solving roof air conditioner leaks really isn't a hard job, as long as you have a bit of knowledge.